UNCG police have always had a presence on move-in day, managing traffic and directing new students to their destination. But this year, they amped up their involvement, helping students and their families unload cars and move into their rooms. “This was the first year we did more than just direct traffic, and we were very pleased with the response we got,” said Paul Lester, chief of UNCG Police. 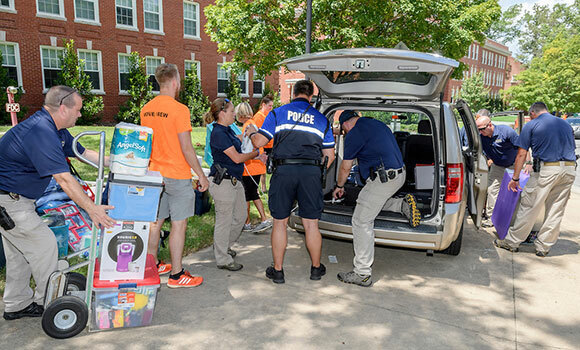 As officers and support staff helped haul the heaviest loads to students’ dorm rooms, they took advantage of the opportunity to get to know the students and their families. And they aren’t stopping at move-in day. UNCG Police are actively looking for ways to get involved with students on campus throughout the year. “We care about the students, staff and faculty,” Lester said, emphasizing his officers’ sincere desire to have a relationship with the community. There’s no better place to make new friends than around the table over a meal. That’s why UNCG Police started Cops in the Caf. Several times each month, officers make a point to sit down with students in Fountain View and eat lunch or dinner with them. Several weeks ago, UNCG Campus Activities and Programs department hosted a community cookout for students and UNCG Police. With the free food and yard games, nearly 300 students stopped by to get to know UNCG’s police force. Earlier this year, officers also took part in Bridging the Gap, an event geared toward building relationships and fostering understanding between police personnel and UNCG students through conversation and improvisation. Lester’s philosophy is driven by a new model of policing based on guidelines from the White House called 21st Century Policing. “The heart and soul of 21st Century Policing is community relations,” he said. So far, it’s working, and it’s breaking down barriers. Lester and his fellow officers have had a variety of students engage in conversations with UNCG police – many of whom would have avoided police in the past. “It’s particularly important to me to be viewed as a community resource and not as an enforcement element of the university,” Lester said.